For the last few days I’ve had a surprise every time I step out the front door or return to the front door. An unexpected fragrance wafts up from somewhere, and I look around to see what it is. In fact the first day I smelled it–probably one week ago– it didn’t even register as a fragrance, just a different sensation. 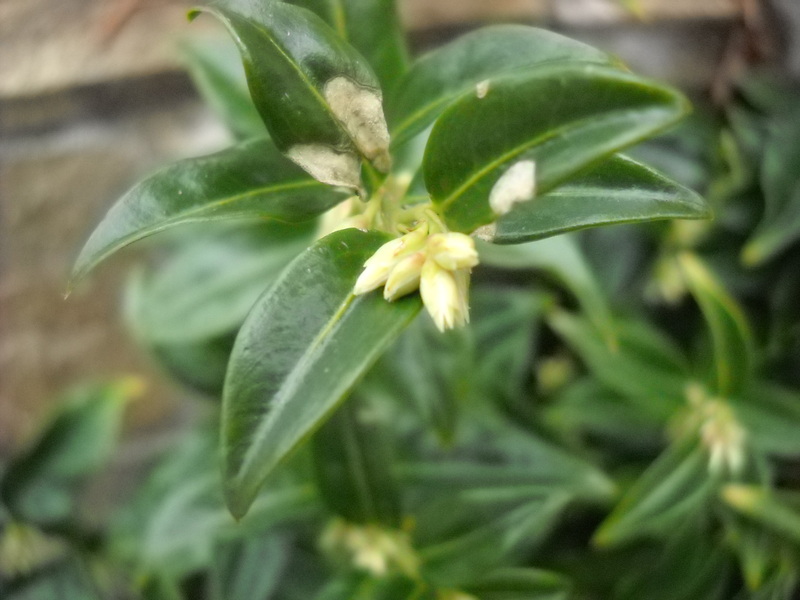 Really silly, since it came from my Sarcococca, which has occupied the same garden spot for 7 years. But every year the amazing fragrance catches me off-guard, which then becomes part of the delight. 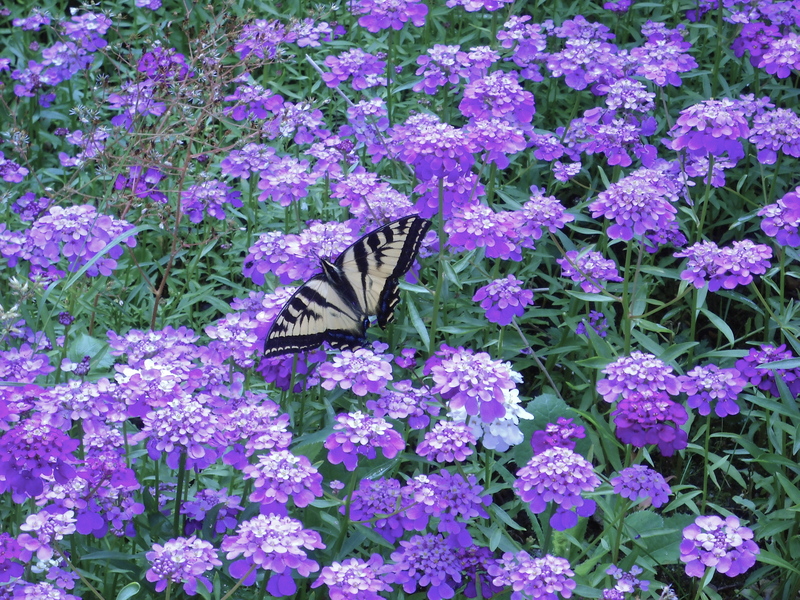 It’s really easy to plan or amend a garden to entertain through the dreary cold, wet winter months. 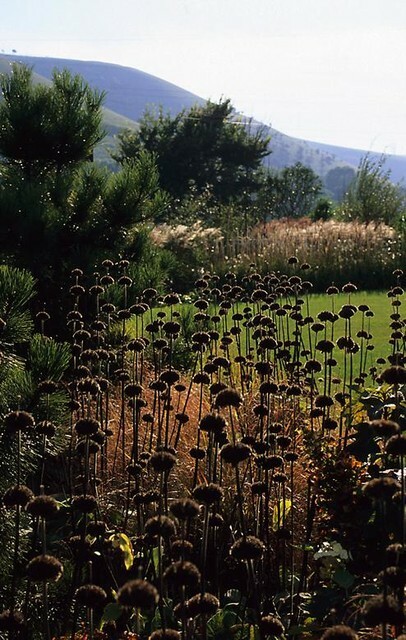 Think of the aspects to the garden that you like through the rest of the year, and then find winter tolerant providers– texture, colour, movement, smell (already mentioned). 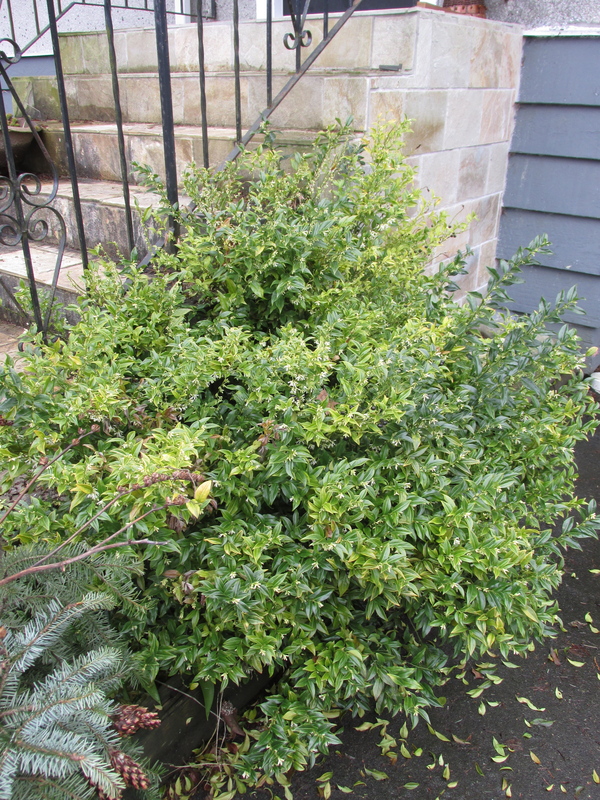 Sarcococca confusa is the perfect little shrub for a shady spot. 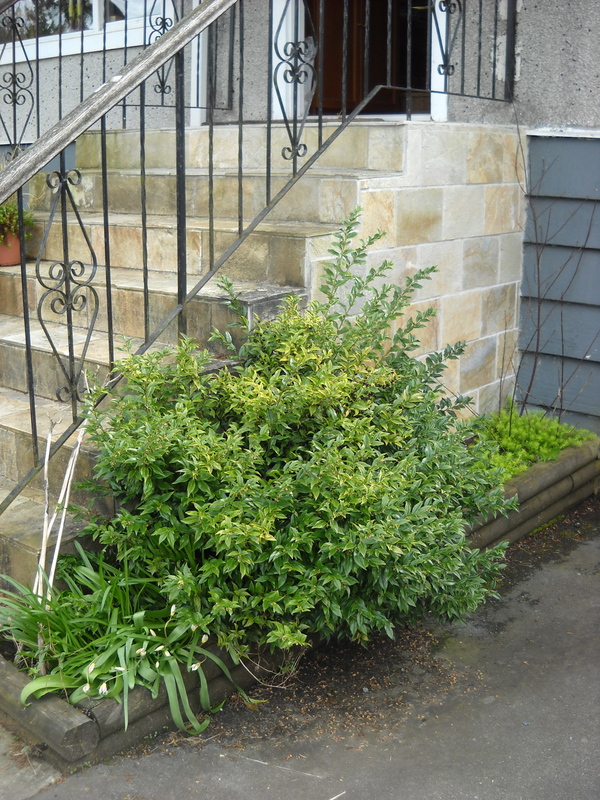 In this less-than-optimal raised bed (6’x 1’x 0.5′) between the driveway and the front steps, it has a civilized habit, not too big, not too small, easily pruned, and always has enough extra branches to allow me to cut some to bring in. (I’m a little sensitive to smells, though, and last year had to put them out the back deck because the aroma was too strong for me.) Be sure to give it enough water; I originally planted two in that tiny border, and the one toward the back (don’t look for it, it’s long gone!) just didn’t thrive. It was a little too sheltered by the roof overhang. 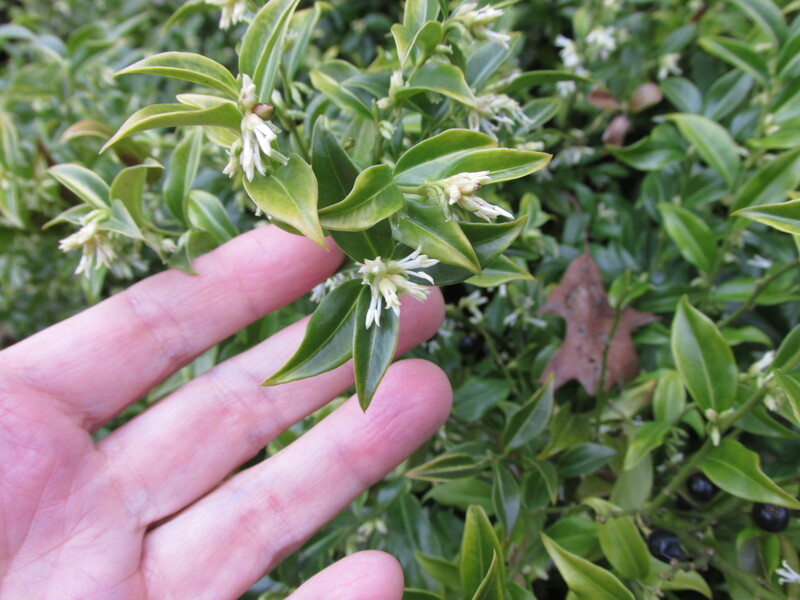 Sarcococca confusa. Tiny flowers, big impact! Helleborus niger or any of the other hellebore species provides great winter interest, especially when you have a few different ones. 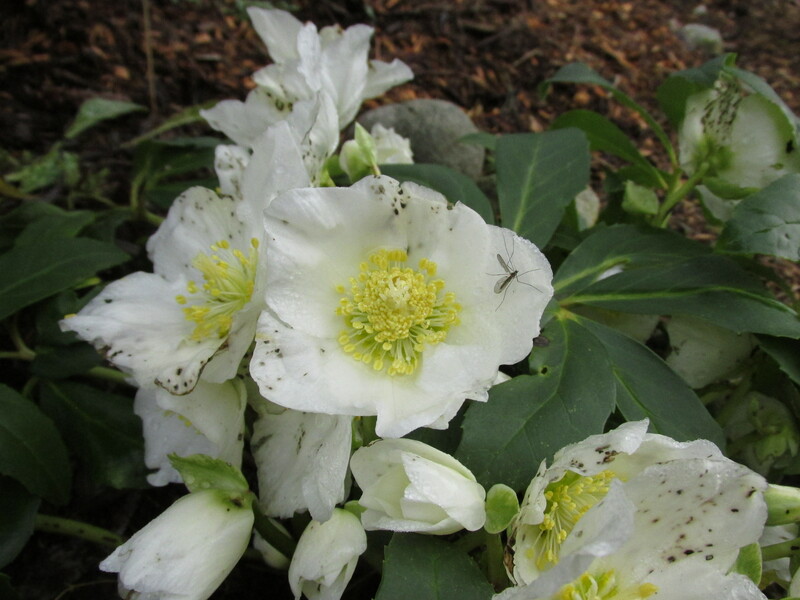 The ‘Jacob’ below is from the “Hellebore Gold Collection”, and unlike many varieties, the flowers face more upward. These started blooming long before Christmas, and will continue for at least a couple months. 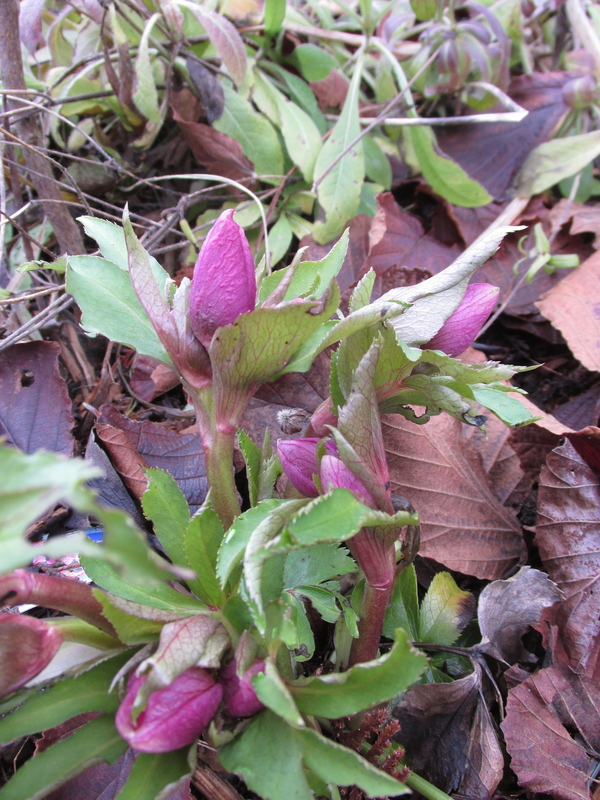 Helleborus niger ‘HCG Jacob Classic’. 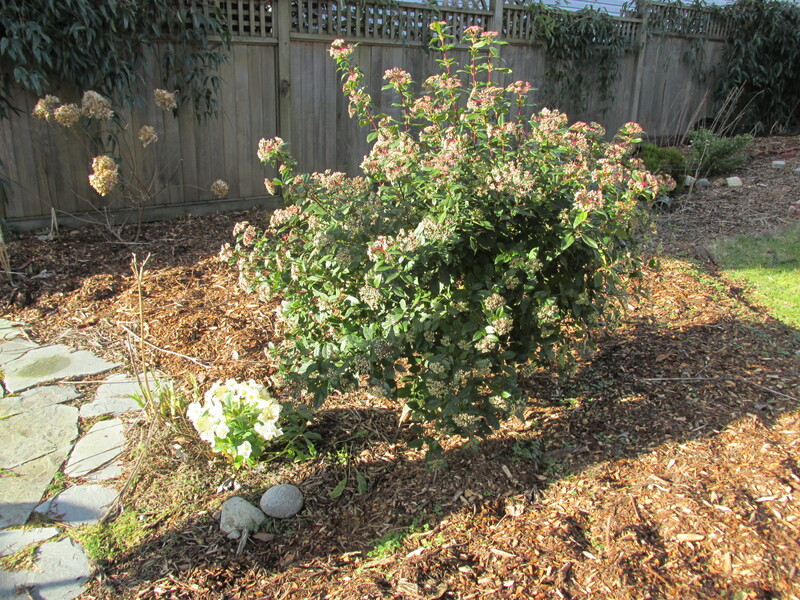 You can just see more blooms under some of the leaves, so I’ll be trimming those off–new leaf growth will start later in the spring. 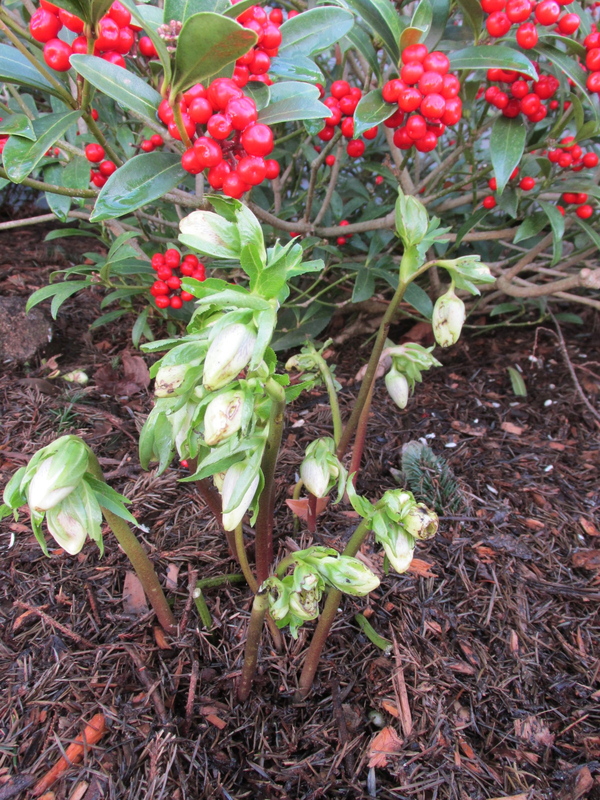 Hellebore niger ‘HCG Jacob Classic’–unfortunately a little winter mould on the blooms. 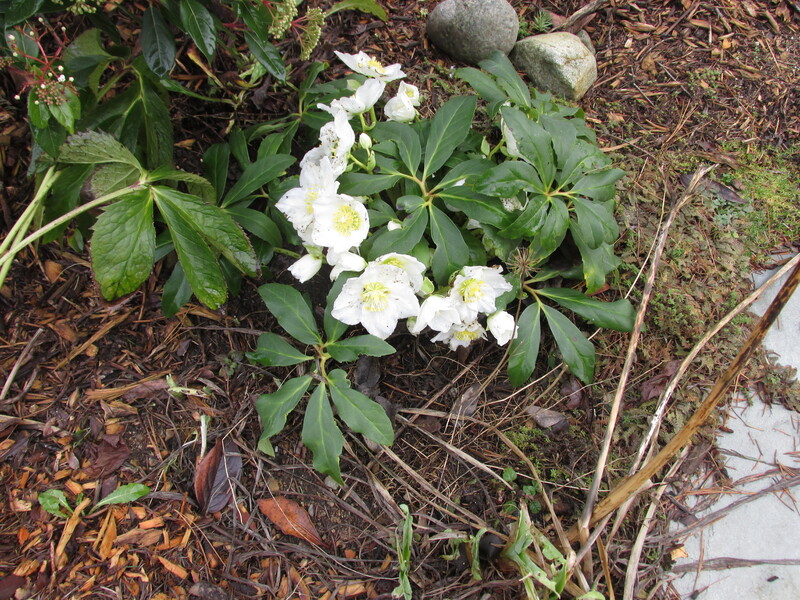 Helleborus nigercors ‘White Beauty’ (?). 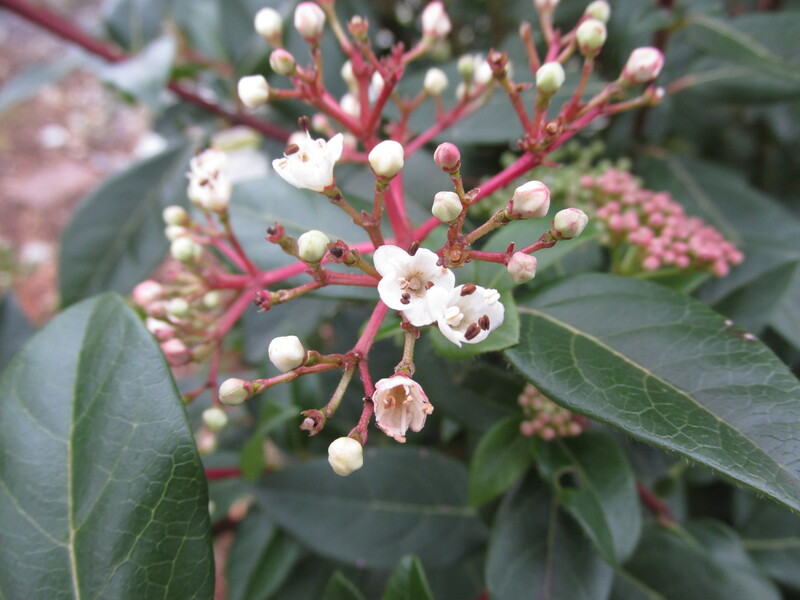 Leaves look pretty unsightly, and the blooms are cleverly concealed behind them. 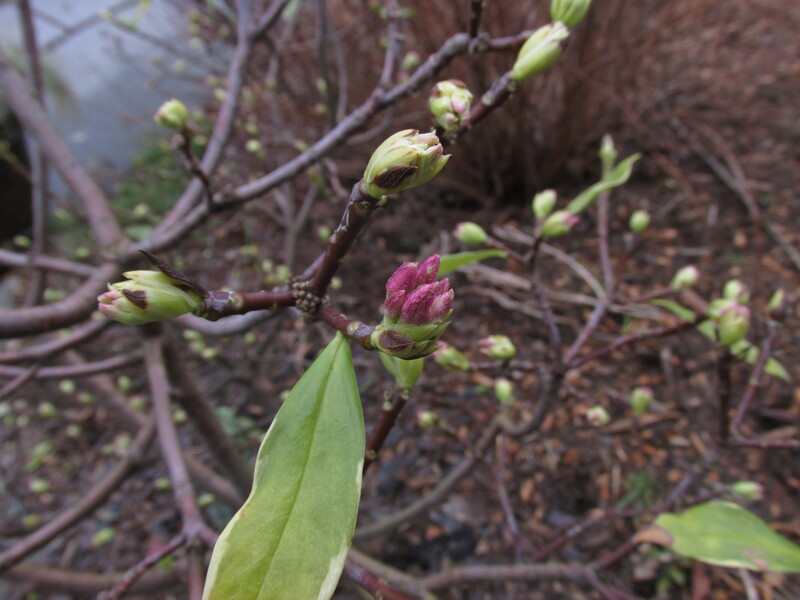 So now’s the time to cut them all away to expose the flower buds. 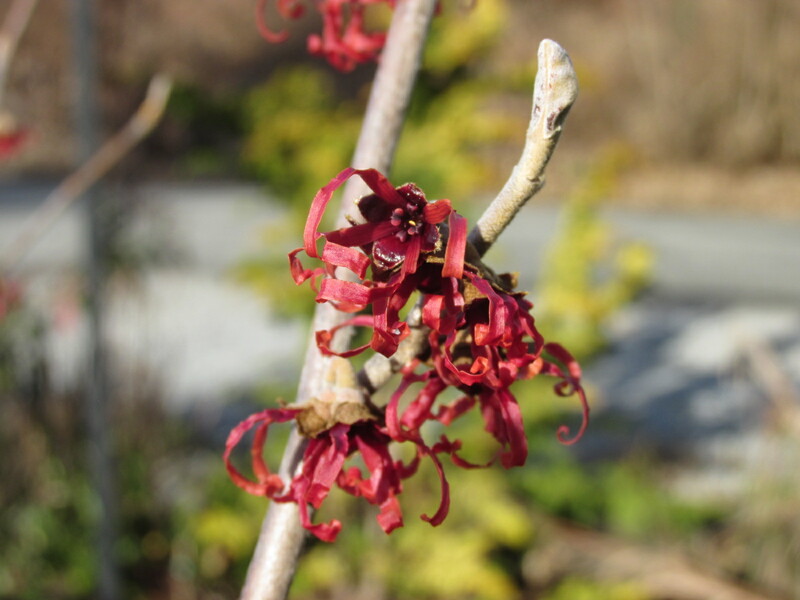 Witchhazel (Hamamelis) is another potentially fragrant item–could be grown as a shrub or a small tree–that is easy to fit into most landscapes. I say potentially, because I don’t at all trust other people’s sense of smell, and beside, even the sources and resources have differing information. 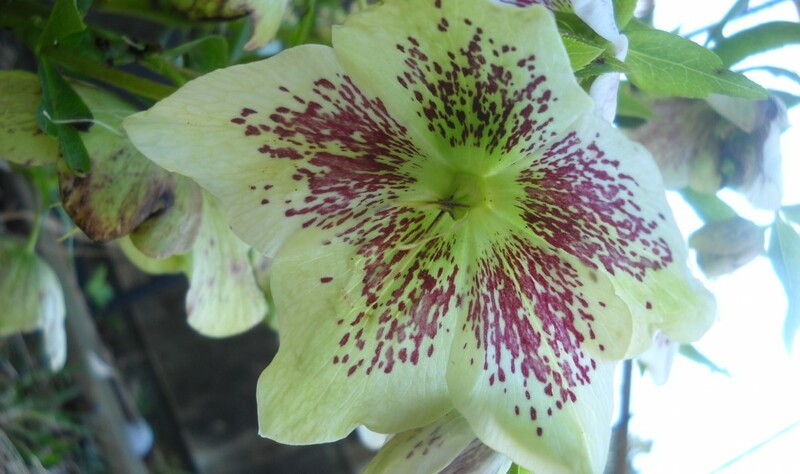 My H. x intermedia ‘Jelena’ is fragrant according to Missouri Botanical Garden, but Pacific Horticulture writes “lack of scent”. Mine unfortunately agrees with PH. But such cute spidery flowers, and lovely vase-shaped growth. Hamamelis x intermedia ‘Jelena’. 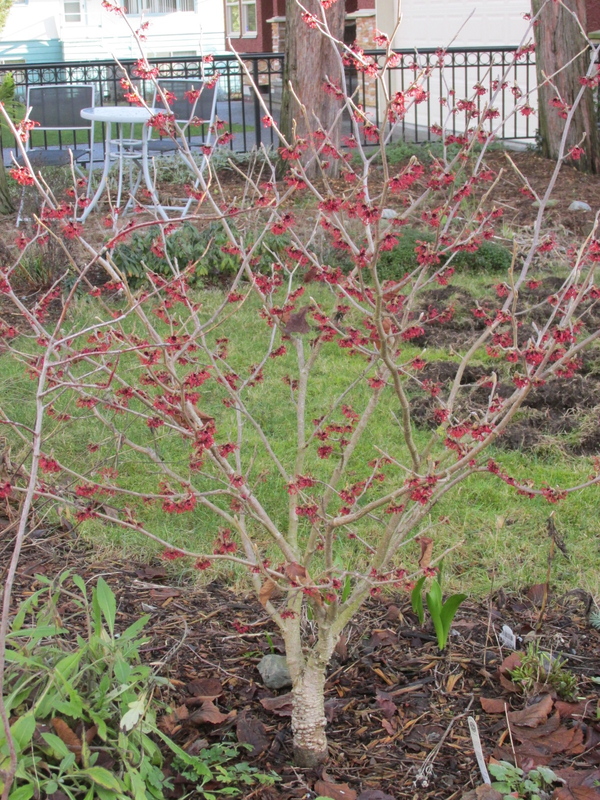 I love this current shape, and will not be doing any pruning this season. You can see the racoon damaged lawn in the background! 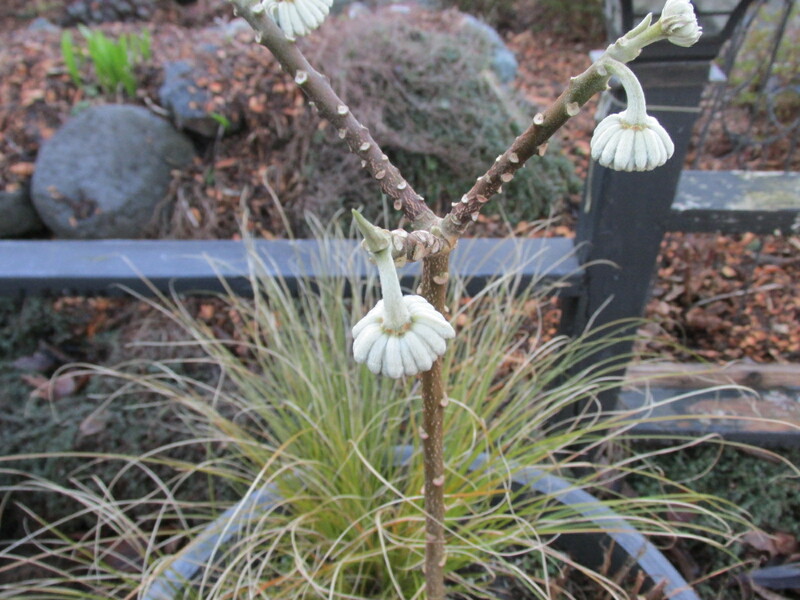 Be careful pruning the Witchhazel–it has a strong tendancy to send up suckers and water sprouts, so prune lightly. Once your hamamelis is established and can spare losing a few branches, you can cut some before the blooms open and bring them indoors to force. 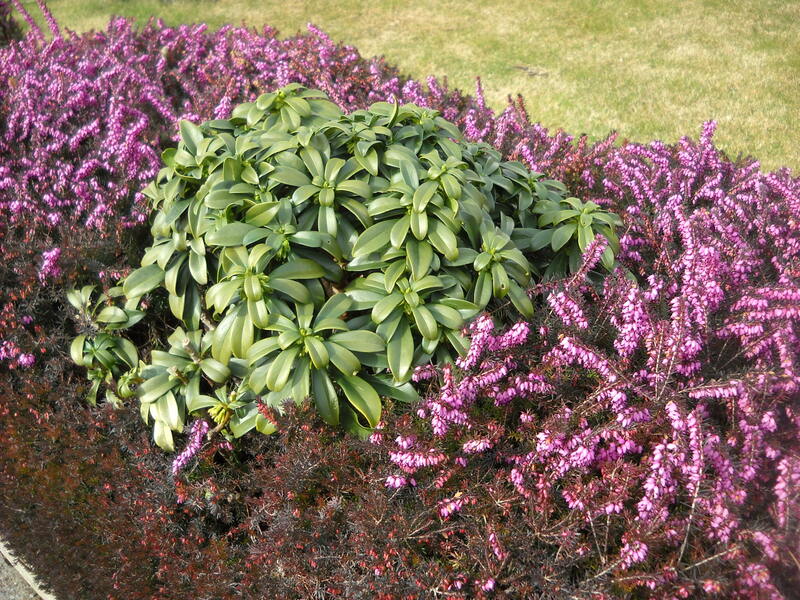 Daphne odora starts to show colourful buds as early as Christmas, but they don’t open until much later. And then not only are the flowers cute but wonderfully fragrant as well. But for now, they just offer the hope of colour and frangrance. 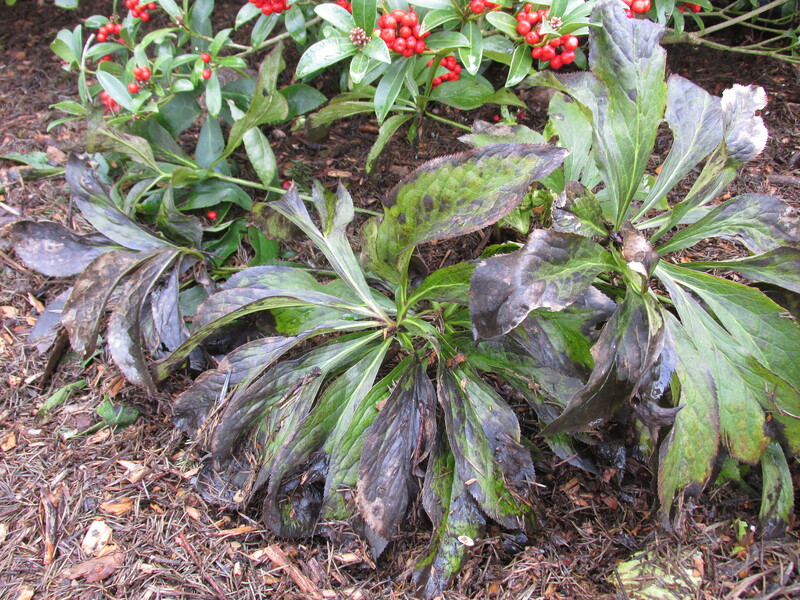 Daphne odora ‘aureomarginata’. Supposedly “semi-evergreen”, but holding on to two leaves does not, in my book, constitute even semi-evergreen. 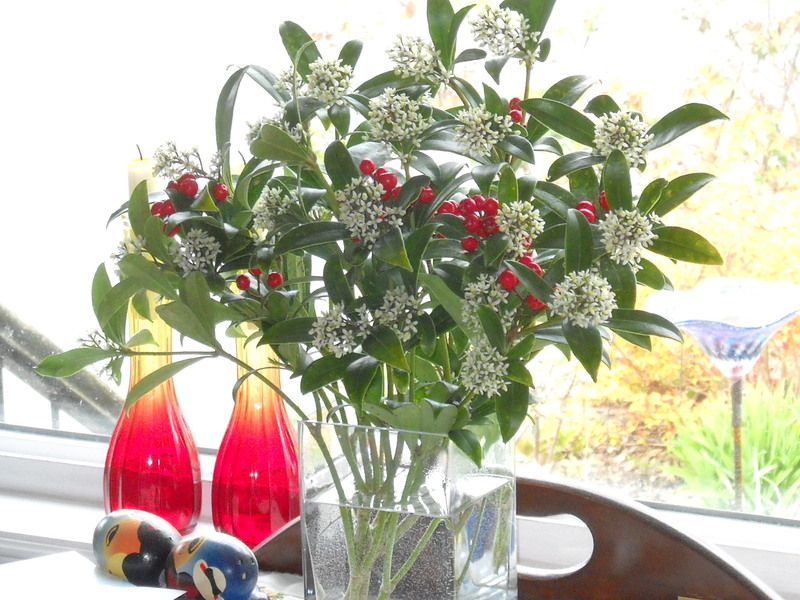 Skimmia japonica. Can’t beat it for colour. And for some reason, the birds don’t eat the berries, so they persist a very long time. These have been”in berry” since probably mid Fall. 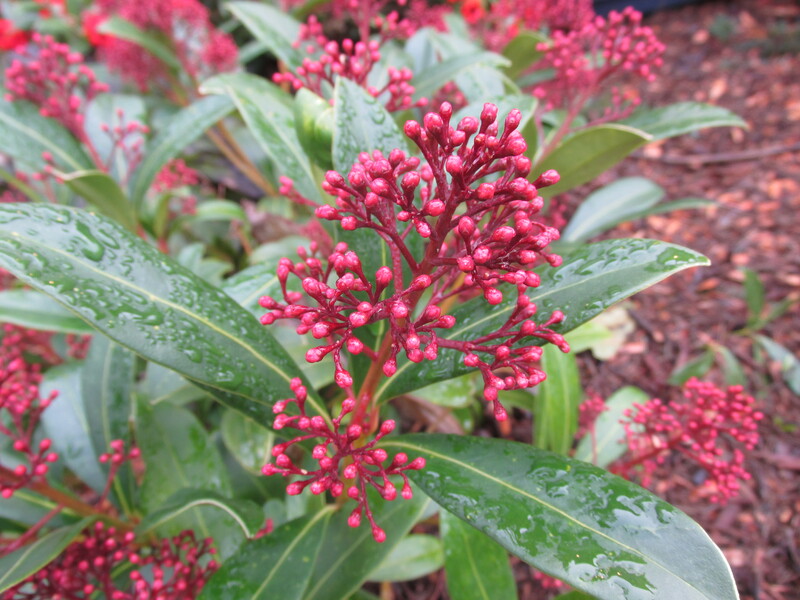 Skimmia japonica–male and female planted together. Both are needed to produce berries. 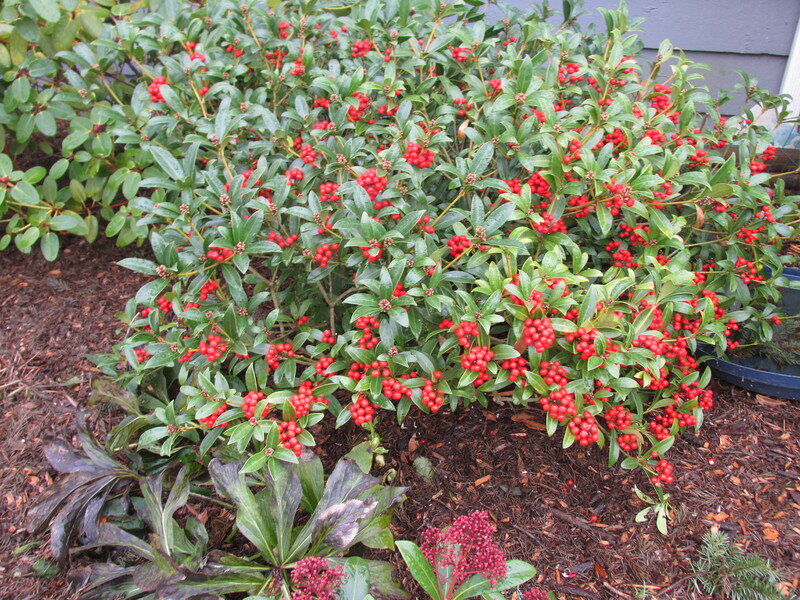 Buds will open in late winter, so after the Sarcococca is finished, and before the Daphne opens, the Skimmia, also right by the house entrance, will waft its fragrance up to the front door. 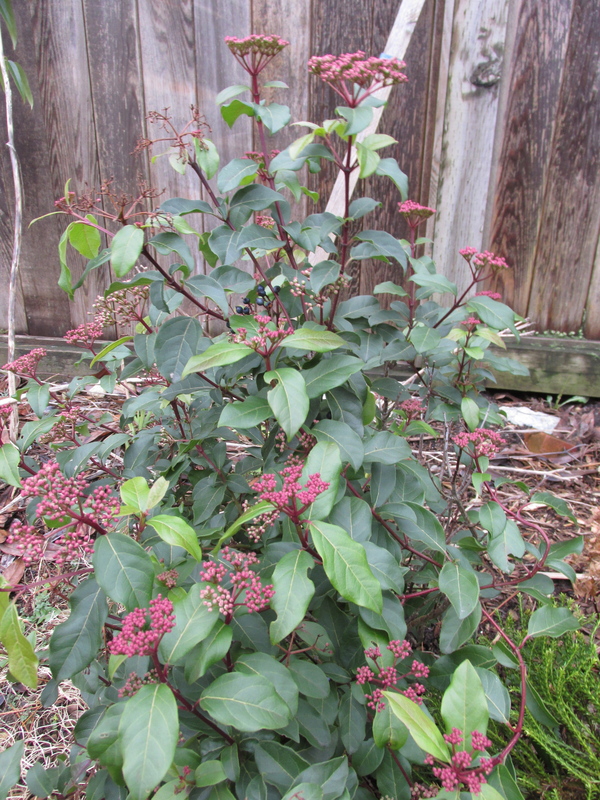 Viburnum tinus ‘Spring bouquet’. 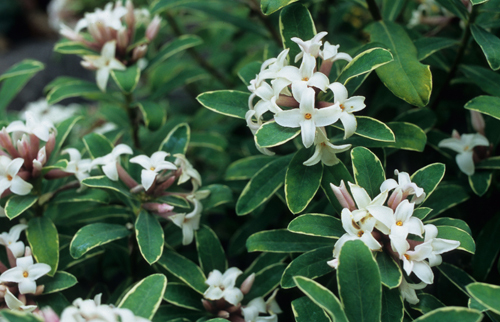 Another lightly fragrant winter bloomer, this slow-growing evergreen carries a halo of buds from late Fall, and is just now beginning to open them up. Viburnum tinus ‘Spring Bouquet’ with hellebores underneath. This is also labelled “Spring Bouquet’, and is likely to be correctly labelled, having the Monrovia label on it, but they surely can’t both be the same variety, since this one is much redder in bud, and slow, slow, slower growing. 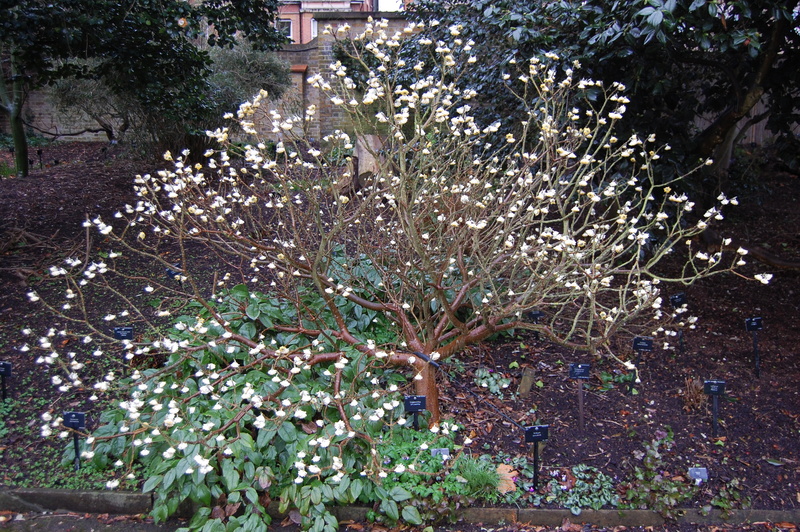 Edgeworthia crysantha. 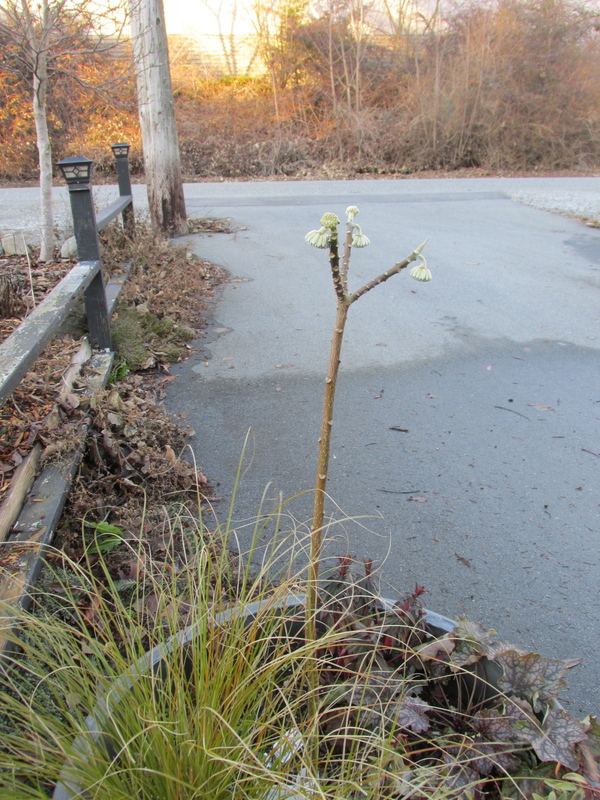 I’d love to show you beautiful pictures of my new Edgeworthia, but unfortunately it’s far from beautiful, still just a stick with a few tassels hanging from it. 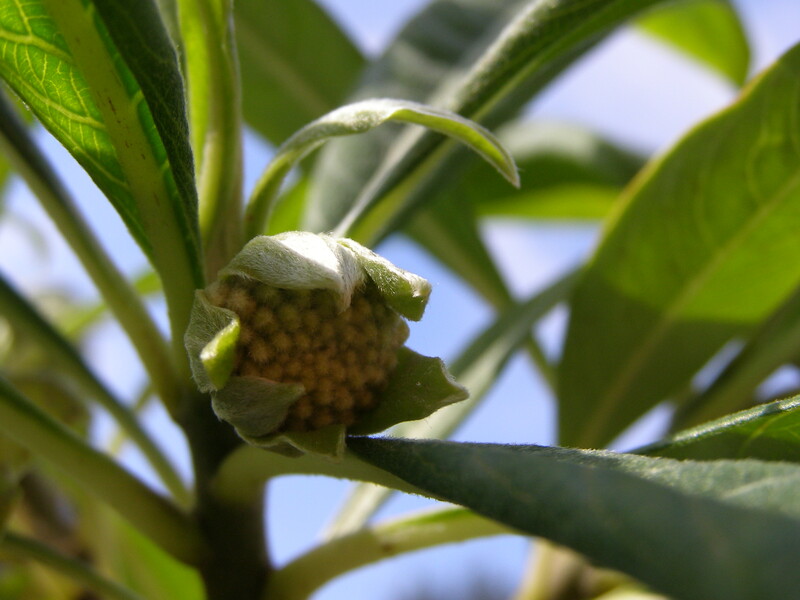 then in Fall, loses its leaves leaving these cute little buds.